Roto-Rooter septic services can do a lot to help keep your septic system running smoothly year after year, with no need for maintenance aside from regular cleaning every 3-5 years. However, much of that depends on you. Septic systems are delicate, and mistreatment can cause them to become clogged…or worse. This is something we see a lot from people accustomed to public sewer systems. Sewers are much more tolerant of foreign objects than septic tanks. Items such as paper towels, sanitary pads, and cooking oils should never be introduced into a septic tank; they’ll just clog things up. You may want to change your cleaning habits if you have a septic tank. Harsh cleaners, like bleach, can do significant damage to the microbial ecosystem within your septic system. If the helpful bacteria in your tank are killed, that will stop the waste from being digested, causing it to fill up much more quickly. Remember, every drain in your home connects to the septic tank. Sending too much food down the sink can also damage the microbial life in your tank, harming the balance between various bacteria. Avoid using the garbage disposal if possible, and always scrape plates and bowls clean into a trash can before rinsing them in the sink. The biggest underground threat to your septic system are plants with invasive root systems. If you’re greenscaping, be careful to place any large plants well away from both the septic tank and the drain field, so their roots don’t cause problems. 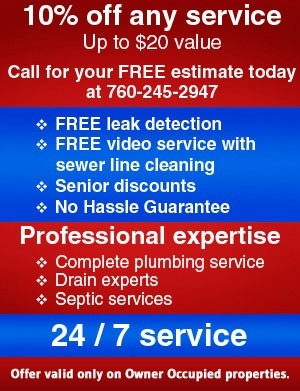 Need septic or plumbing help? Call for Roto-Rooter septic services today! 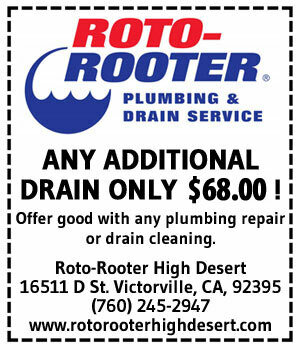 Roto-Rooter High Desert are your local experts in septic system installation and maintenance. Whenever you have septic problems, just call your local Roto-Rooter!